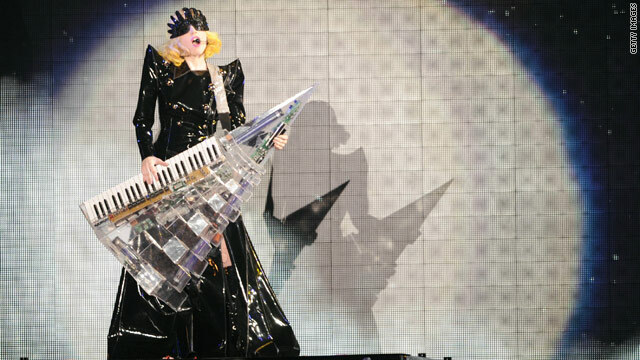 Did geek camp teach Lady Gaga to rock? (CNN) -- Back when Lady Gaga was just a girl from New York named Stefani Germanotta, she might have been seen as a geek. Just as a select group of gifted kids do today, she spent three weeks of summer in an intense learning program that offered classes on everything from math to robots to monsters. Gaga, Facebook's Mark Zuckerberg and Google's Sergey Brin are all alumni of the Center for Talented Youth (CTY) at Johns Hopkins University. CTY and the Duke Talent Identification Program (TIP) are two of the most well-known highly selective programs that have given rise to high-achieving adults. "Being labeled as 'gifted' as a middle school student is a social kiss of death," said Dr. Alison Stuebe, an alumna of the Duke TIP program, which had its largest season ever in 2010 with more than 3,100 students. "To go to a place where, rather than that being a liability, was actually a reason you got to go at all, was just a transforming experience," she said. 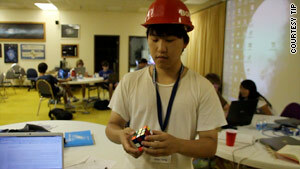 Dillon Dong takes a break from TIP's astronomy, physics and astrobiology class to show off his Rubik's Cube skills. There is a misperception that talented youths get what they need in school. In fact, regular school classes don't always allow these kids to reach their full potential, said Brian Cooper, TIP's director of domestic educational programs. Summer sessions like TIP's are needed more and more because in tough economic times, schools are cutting programs for gifted students, he said. TIP provides an environment where they can feed their passions for the subjects they love without having to worry about grades and competition, he said. But first, kids have to prove themselves by taking the SAT in about seventh grade, and they need to score as well as or better than 50 percent of the college-bound juniors and seniors taking the SAT or ACT (you can retest later). Summer Institute for the Gifted, another program, also accepts letters of recommendation and participation in a gifted program as credentials. 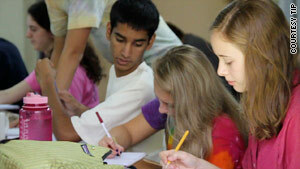 These camps have programs at various colleges in the U.S., and some in other countries, too. Even with proven talent, these programs aren't cheap. TIP charges about $3,600 for a three-week session; CTY is around the same. Summer Institute for the Gifted (SIG), which draws talented youths from kindergarten to 11th grade, charges $4,225 to live at the program and $2,195 for commuters for three weeks. All of these programs do offer financial assistance to some students, however. Being labeled as 'gifted' as a middle school student is a social kiss of death. Students and alumni tend to agree that it's all worth it. "It grows you as an individual," said Drew Curtis, founder of fark.com, who attended TIP programs for four summers beginning at age 13. "The ability to be yourself is probably the most valuable thing." TIP alumni range from bioengineers and lawyers to writers and founders of medical companies. Stuebe is now an obstetrician-gynecologist at the University of North Carolina Health Care System. Many still draw on their experience of gifted summer programs. Blake Eskin, web editor at The New Yorker, took computer science classes at CTY in the early 1980s. As an adult, he went into journalism, but today, his job involves integrating journalism with systems of data structure. "Twenty years later, it's not like what I learned in those classes directly applies, but it just has been so indispensable -- that kind of foundation in computer science theory has been kind of indispensable," he said. "What I learned when I was 12 and 13, I don't know how I would be doing this job without that." TIP students stay focused in a tropical medicine and ethnobiology class this summer. Graduates of these programs keep in touch, even decades later. Eskin has two or three friends from his CTY years, and Curtis still has some from TIP. Stuebe married another TIPster 11 years ago, although she and her husband did not actually socialize at the program; a TIP teacher officiated the wedding. They know another couple who met at TIP, dated long-distance afterward, and are also married. "I was like, 'Yes, yes, I'm not a freak, at least amongst freaks,' " Stuebe said of her TIP experience. "And it gave me confidence that someday, when we all grew up, it would be OK to like to talk about intellectual things and want to do research in science and all that other kind of stuff." Sierra Royalty, 13, can relate. She feels left out at school when she talks about her favorite books because usually, no one has heard of them. But this summer at TIP's University of Georgia campus, she spent an entire evening sitting in the room of a friend talking about her favorite parts of James Patterson's "When the Wind Blows." "Everyone is more on an equal intellectual level. You can really get into discussions with people and they'll know exactly what you're talking about, and they can bring more stuff into it," said Royalty, of Gastonia, North Carolina, who took a course called "Zombies and Vampires." The "Zombies and Vampires" haunted house was a real highlight for Royalty. Students researched mythological creatures from different cultures such as boggarts, harpies and Filipino vampires, and included them in the house. They also wrote papers about the magical creature of their choice. Other students can choose to learn an entire year's worth of high school math in three weeks. But even math at TIP has its fun: In Algebra II, for example, students explored the quadratic equation by throwing a Barbie doll off a bridge with various parachute designs. Abby Mrvos examines a horse at a Duke TIP veterinary class on the campus of the University of Georgia. Veterinary medicine is another TIP offering at the University of Georgia that got students excited about nontraditional assignments. The class included examinations of a dog, a cow's stomach and work with other animals such as a horse, a goat and an alpaca. Taking a class like that jump-starts serious conversations that students would never have at home. Meghan Dorn of Charlotte, North Carolina, is only a junior in high school, but she's had long talks about her future medical career at TIP this summer. Her peers helped her weigh the pros and cons of going into veterinary medicine vs. getting a medical degree, something she never would have done back home. "If you're around a bunch of people like there are at schools and stuff, then you can kind of get down if they don't really like it. But when you're surrounded by so many people who are always excited and happy and everybody's into everything, it just makes it a million times better," Royalty said.